The new module has expanded our Contact Supplier functionality to increase interactivity between specifier and product partner. As a part of our development of Masterspec as a truly collaborative specification platform we've been working hard to provide the industry with new innovations to involve the supplier in the specification writing process. While working within your branded work section, you as the designer now have the option of selecting a contact icon, which then requests the supplier's assistance. Masterspec users will be able to (depending on the services the manufacturer nominates) request the Product partner comment on your work section using editor notes, edit your work section directly in Masterspec, and even completely re-write your work section so that you can replace it in your project. Masterspec Product Partners have been briefed and are preparing their teams to provide the services you will need. While most Product Partners will provide all three levels of advice, there are some whose structure won't allow the full package of responses. When you select the Contact Supplier link at the top of a branded Work Section (see above) the system will deliver a window where you can choose a request level and enter some details about your project to help the product partner. Note you may see one, two or all three of these options depending on what level of support the Supplier will deliver. You will see either Comment, Edit or Replace or a combination thereof. 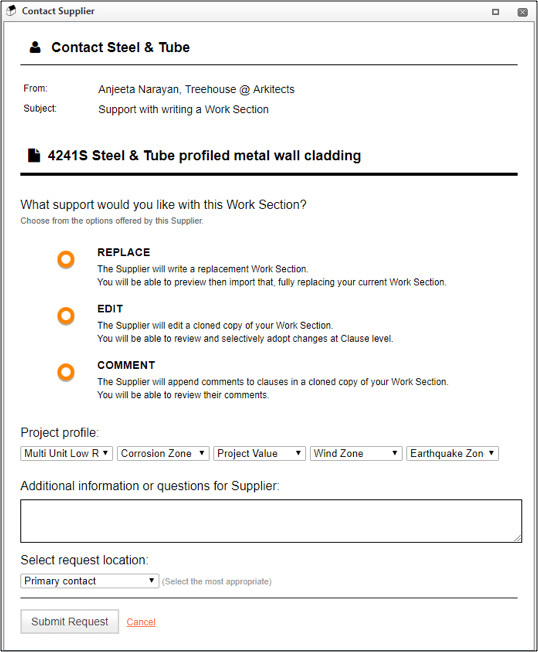 The Supplier will add comments to clauses in your work section. They cannot edit any of the content, but can make comments on the content. You will be able to review their comments then make any changes you want to make with the regular edit function. The Supplier will edit a copy of your work section. You can view the returned information and choose to include or exclude the content on a clause by clause basis. The Supplier will write a replacement Work Section based on the information you supply. You will be able to preview the suppliers suggestions and then import the full work section into your project. You can then continue editing as per usual. 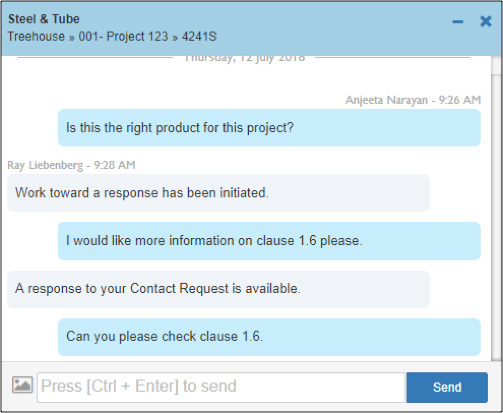 Below the support choice are drop-downs to establish some basic project information for the Supplier, and a text box to write any further messages. You can then select the area or suitable support person from the list that the Product Partner has supplied. When you send to the Supplier your work section will be locked until the Supplier sends the Section back to you. Throughout the process you will have a live chat window displayed in the section workspace. This not only allows more contact and questions to be asked and answered, but images can be uploaded both ways to help clarify design points or advice. Further detailed training is available on our Training pages at this link - look for the Work Section Support items in the right hand Training navigation. Masterspec Work Section Support is just the beginning of further expansion of the NextGen2 platform to enable and encourage collaboration between design professionals, suppliers, manufacturers and constructors. A major part of our budget is spent on R&D to ensure Masterspec remains not only a remarkable collaboration tool but a continuing 'enabler of excellence' for the New Zealand industry.